AKA: Is there a Vet in the House? Cast: Jinnai Takanori, Yoshimoto Miyu, Nogiwa Yoko and Makita Tetsuya. 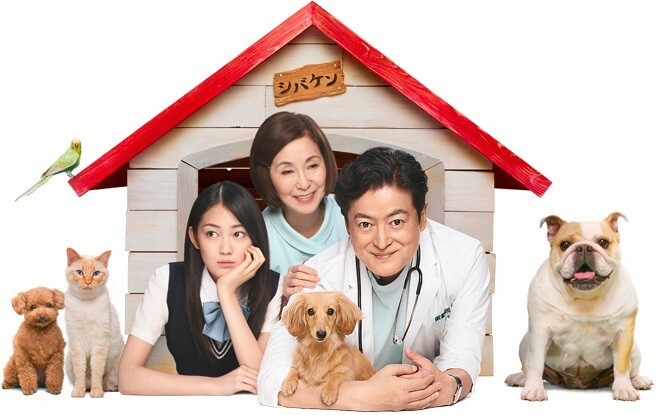 In the Shiba family there are 3 members: Shiba Hanae (Nogiwa Yoko), Shiba Kentaro (Jinnai Takanori) and Shiba Hinako (Yoshimoto Miyu). Even though all of them share the same surname, none of them are related to blood. Kentaro was adopted by Hanaes husband, and after her husband had passed, he stayed her son. Hinako was adopted by Kentaro, when a friend of his had abandoned Hinako, and at her 15th birthday, he told her that she was adopted, but could decide on her own whether she wanted to annul it or stay as a Shiba, which she wanted. The family runs a vet clinic, where Hanae is the nurse and Kentaro is the vet. One day a bulldog is left abandoned in front of the clinic and they decide to keep it, increasing the family number. They help people who have family trouble, and usually, if the lady-in-need is pretty, Kentaro falls head over heels - and decides to help with all his ability. This gives the rest of the family a headache, but nonetheless they help too. When I read about this drama years ago, I thought I would’ve been a nice family drama. The idea of a vet and a family running it sounded interesting, and I felt as if it had potential. That it did, the potential part. I don’t even know where to start… The whole drama was just a miss. It wasn’t emotional, funny, or even interesting. The family didn’t seem close, the running jokes weren’t funny at all, and the storyline with the father/family helping random customers was so boring, I didn’t feel anything while watching. The only reason for my 2 stars rating is because of the quality, of screenplay. And some of the side stories where good to be honest. All in all, I would not recommend, unless the humor (reminds me of Unubore Deka) is your type.